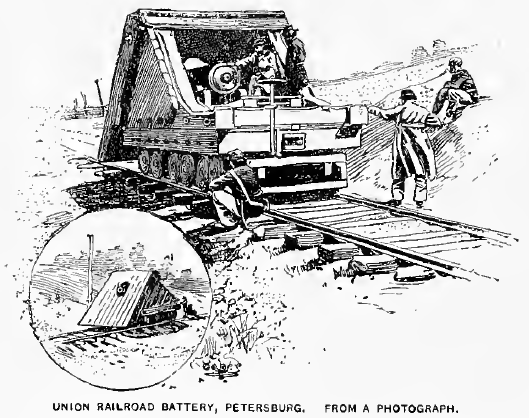 The story of the clash into the Petersburg crater and the struggle there, with the thrilling experiences of the men engaged, is too broad for one witness to cover, but the record of one regiment will convey a fair idea of what the battle was. The selection of troops to lead the assault was settled on the eve of the movement, but the plans and purposes for the day were not communicated to any soldier below the rank of field-officer. There were indications of a forward movement that the privates could well interpret, such as orders for extra rations, the concentration of troops, and the massing of lines of battle close to the enemy’s works in front of Cemetery Hill. The honor of leading the assault came by rotation to Colonel E. G. Marshall’s brigade. During the night his regiments were marched to a position about twenty rods from the mine, where a single breastwork, an old Confederate work, turned, lay between them and the fort. The condition of this work was not pointed out to the men, nor was any notice given them of what would occur or what was expected in the emergency before them. The men dozed and rested a couple of hours before daylight, awaiting developments. Suddenly the earth trembled, and a black pyramid shot into the air, so close that it seemed as though in spreading after the upward force was spent it would fall on and crush those nearest. It was so startling that the first two lines of men broke, for it was believed to be an earthquake or a Confederate mine sprung upon us. No one believed that a Confederate fort was so near. The 14th New York Heavy Artillery, to which I belonged, formed the third line, and was Colonel Marshall’s own regiment. With two lines in front and the familiar presence of their own commander to encourage them, these men remained comparatively steady, although there was confusion for a brief spell. Just how far this confusion set back the movement will be seen from the experiences of the first moments. Lieutenant Thomson, of Company B, was thrown into a mudhole by the shock, and just as he came up blinded and bespattered before his astonished soldiers, the call rang out,” Forward!” Forward meant across those breastworks in front, and these were as high as a man’s shoulder. 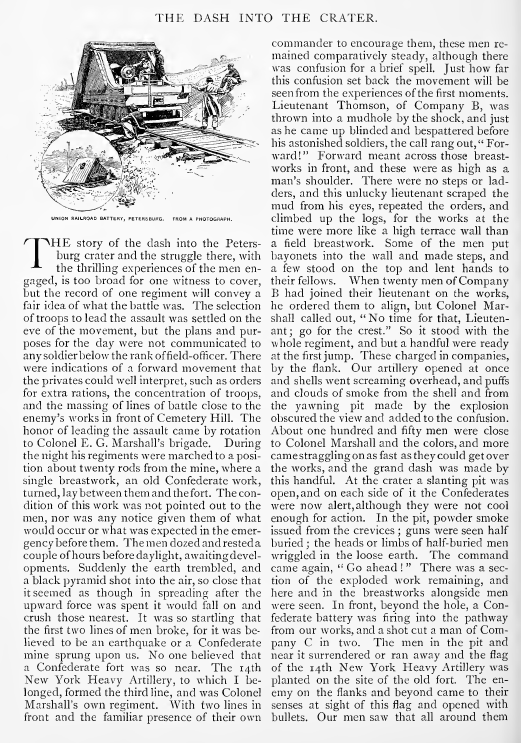 There were no steps or ladders, and this unlucky lieutenant scraped the mud from his eyes, repeated the orders, and climbed up the logs, for the works at the time were more like a high terrace wall than a field breastwork. Some of the men put bayonets into the wall and made steps, and a few stood on the top and lent hands to their fellows. When twenty men of Company B had joined their lieutenant on the works, he ordered them to align, but Colonel Marshall called out, ” No time for that, Lieutenant; go for the crest.” So it stood with the whole regiment, and but a handful were ready at the first jump. These charged in companies, by the flank. Our artillery opened at once and shells went screaming overhead, and puffs and clouds of smoke from the shell and from the yawning pit made by the explosion obscured the view and added to the confusion. About one hundred and fifty men were close to Colonel Marshall and the colors, and more came straggling on as fast as they could get over the works, and the grand dash was made by this handful. At the crater a slanting pit was open, and on each side of it the Confederates were now alert, although they were not cool enough for action. In the pit, powder smoke issued from the crevices ; guns were seen half buried ; the heads or limbs of half-buried men wriggled in the loose earth. The command came again, “Go ahead ! ” There was a section of the exploded work remaining, and here and in the breastworks alongside men were seen. In front, beyond the hole, a Confederate battery was firing into the pathway from our works, and a shot cut a man of Company C in two. The men in the pit and near it surrendered or ran away and the flag of the 14th New York Heavy Artillery was planted on the site of the old fort. The enemy on the flanks and beyond came to their senses at sight of this flag and opened with bullets. Our men saw that all around them were superior numbers, and even from the rear they received a fire, for there were traverses running toward our own lines that sheltered men while firing across the plateau and, reversely, into the crater. Still the determination was to push on, and a dash was made for the second breastwork. Here the Confederates made a stand. Some of our men got so close that guns were clubbed, and Sergeant James S. Hill of Company C took a regimental battle-flag by force. The fire from all sides was hot, and the men fell back to the old fort and into the crater. It seemed now to those on the spot that the best thing to do was to defend the breach as a basis for forward movements, for there were Confederates all about, possibly in numbers sufficient to recapture it. Colonel Marshall and some of his officers and men got the old cannon into position and opened on the Confederates that were nearest. (1) By this time other regiments had come up, and the 2d Pennsylvania Heavy Artillery, of our brigade, joined in this work. General Hartranft came in with a command, and when he saw the action of Marshall’s men, called out, “Three cheers for the 14th!” The brigades following Marshall’s moved against the breastworks on the flanks of the crater, but they had to face artillery and muskets at every step, and as the lines broke the men inevitably came to the crater. There were now on the scene detachments from several commands without a supreme commander. Officers and men alike called for definite purposes and orders. Our brigade had entered the breach and could not advance until the flanks were cleared. The brigades sent after us to clear the flanks had been beaten off and had taken refuge in the pit. Difficulties increased every second, because the Confederates grew bolder and their fire began to tell. Every fresh advance from our supports was anxiously watched, but in the end despairing curses went up because the unsuccessful columns fell back and packed the overcrowded hole. The wounded men came into the pit in preference to going to our own lines, because the way back was swept by the enemy. After the first hour the scene in the crater was terrible. Refugees found that shots fell there as well as outside, and many who came in looking for safety met disaster. The last rally was when the colored division moved out from our works in splendid order, which promised us success. RELICS IN THE CRATER MUSEUM. 1. Musket-barrel with bullet-hole at the muzzle. 2. Musket burst by two bullets meeting in the barrel, a bullet having entered the muzzle as the gun was discharged. 3. 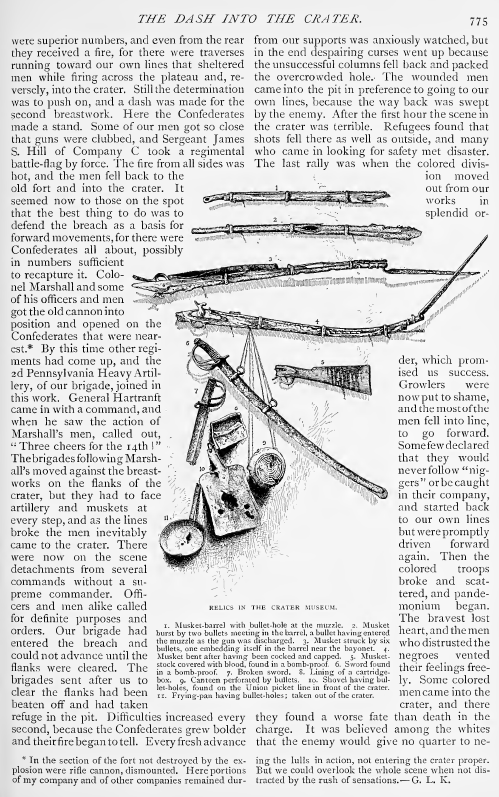 Musket struck by six bullets, one embedding itself in the barrel near the bayonet. 4. Musket bent after having been cocked and capped. 5. 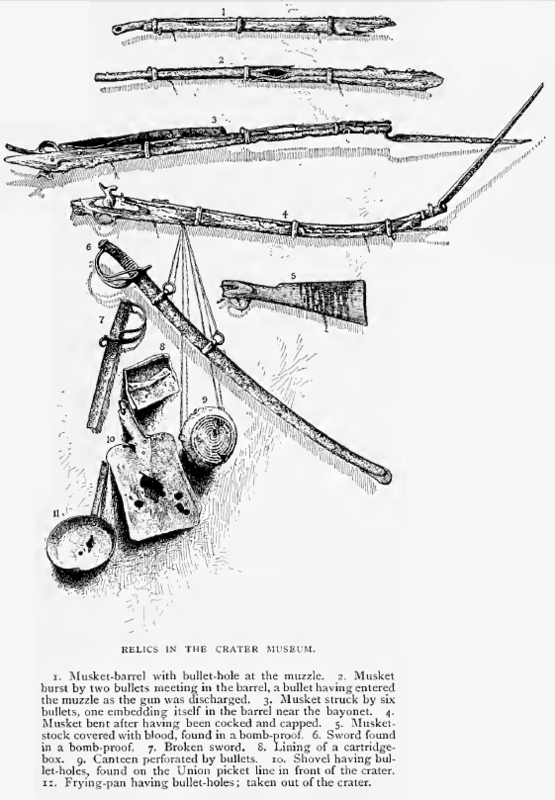 Musket-stock covered with blood, found in a bomb-proof 6. Sword found in a bomb-proof. 7. Broken sword. 8. Lining of a cartridge-box. 9. Canteen perforated by bullets. 10. Shovel having bullet-holes, found on the Union picket line in front of the crater. 11. Frying-pan having bullet-holes; taken out of the crater. Growlers were now put to shame, and the most of the men fell into line, to go forward. Some few declared that they would never follow “niggers” or be caught in their company, and started back to our own lines but were promptly driven forward again. Then the colored troops broke and scattered, and pandemonium began. The bravest lost heart, and the men who distrusted the negroes vented their feelings freely. Some colored men came into the crater, and there they found a fate worse than death in the charge. It was believed among the whites that the enemy would give no quarter to negroes, or to the whites taken with them, and so to be shut up with blacks in the crater was equal to a doom of death. The officers began to scheme for a retreat. At the time there were one general of division and four brigade commanders on the spot, — R. B. Potter, E. G. Marshall, S. G. Griffin, W. F. Bartlett, and John F. Hartranft. Orders came to withdraw the men, but the space between the hole and our works was commanded at every point by Confederate artillery and sharp-shooters. The road was corduroyed with bodies of the fallen. The commandant of the First Battalion of the 14th Regiment, Captain Houghton, Company L, proposed to lead his men back, but they all preferred to remain, and the general officers advised all hands to wait. One plan was to send for spades, and have two parties at work at either end digging a ditch for passage. Another was to wait until nightfall. Both plans were cut short by the action of the enemy. Two or three small parties advanced on the crater, and were repulsed; yet reenforcements were coming up, and it was evident that the spot must be abandoned. Captain Houghton watched the men who attempted to cross back to the works and saw that a gun throwing case-shot did most of the damage to the retreat. After a discharge of this gun he started and passed its range before another discharge came. In crossing the space he found it planted so thick with the fallen that he could not avoid stepping on them. As soon as he reached the works, he directed a sharp musketry fire upon the points whence the hottest Confederate fire came and partly silenced it, so that a few more men got home safely. Colonel Marshall and General Bartlett were among those who remained in the crater and were captured. The wisdom of selecting the Ninth Corps for the assault has been questioned by high authority. The quality of men for this kind of work depends on their present spirit, commonly called the morale. This condition is easily affected and is an uncertain quantity among the very best troops. Three points may be noted as to the spirit of our corps at the time, and the same would be true of the other corps of the army. First, there was a feeling that the soldiers had been pushed persistently into slaughter-pens, from the Wilderness down, and needlessly sacrificed by such methods. Second, there was a determination to rebel against further slapdash assaults. Third, the strongest element of all, as affecting the general spirit, was the all-powerful ambition to take Petersburg and end the struggle. It was universally felt by the men in the breach that the explosion of the mine was a means to that end. But the first assaulting columns would not go on and seize the crest without supports, and these supports did not come. 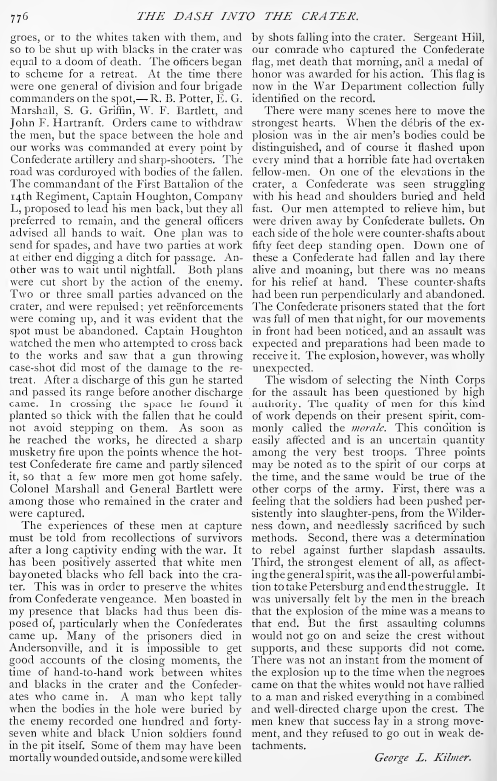 There was not an instant from the moment of the explosion up to the time when the negroes came on that the whites would not have rallied to a man and risked everything in a combined and well-directed charge upon the crest. The men knew that success lay in a strong movement, and they refused to go out in weak detachments. (1) In the section of the fort not destroyed by the explosion were rifle cannon, dismounted. Here portions of my company and of other companies remained during the lulls in action, not entering the crater proper. But we could overlook the whole scene when not distracted by the rush of sensations. — G. L. K.